Sahrawi tribal men performing the fantasia at the Tan-Tan Moussem in Tan-Tan, Morocco. Photo by Maxim Massalitin, Wikipedia Commons. It seems a long time ago, but I still remember the wonderful stories that my grandmother once told me when I was a child; the story of one thousand and one nights, the Prophets companions, and the most reminiscent is the story of Ibn Battuta, a geographer and explorer who lived in the medieval period. Ibn Battuta was born on February 24, 1304 and died at the age of 65 in Marinid, Morocco, his homeland. The evidence to corroborate the relationship of Islam in Morocco and Indonesia can be seen from the equation of wooden carving ornaments, which are rich in color on the roofs of some mosques in Morocco and with those of cultural heritage buildings in Indonesia; such as Sunan Gunung Jati Mosque in Cirebon and Said Naum Mosque in Jakarta. The close relationship between Morocco and Indonesia dates back to Battuta’s visit to Tanah Rencong, Aceh in 1345. Batutta met the Sultan of Pasai who was at that time ruled by Sultan Al-Malik Al-Zahir Jamal-ad-Din. Batutta wrote in his diary that the island of Sumatra is rich in camphor, betel nut, cloves, and tin. Ibn Batutta lived in a wooden house in the Sultanate of Pasai for two weeks before continuing his journey to China and had made a stopover in Malacca for several days using one of the sailing ships owned by Sultan of Pasai who also provided all the equipment for this Moroccan explorer. Although, many people say that Morocco is distant from modernity as in the big cities of the world, in fact this country is unique. It is located on the African continent, thus making the country of 33.8 million inhabitants rich in culture mixed with values that are standing still in there. The very tough Berber tribes who live in the Sahara Desert in the western part of the country are native Moroccan. There are about six languages used by the Moroccan population such as; Arabic, Berber, Arabic-Morocco, Arab-Hassanya, and French, which is a relic of colonialism and almost all levels of society can communicate with the six languages. Ouadia Benabdellah is the Ambassador of the Kingdom of Morocco who has been appointed to a diplomatic post in Jakarta since November 11, 2016. The 58-year-old man feels obliged to establish a harmonious bilateral relationship between Morocco and Indonesia, with all the challenges. Friendly residents of Jakarta, hot and humid air, and heavy traffic are the first impression when Benabdellah sets foot in the capital. After a few months, he already felt like Indonesian people in general, who are accustomed to the street conditions in Jakarta which are almost always crowd every day. It is not easy for Benabdellah to say what is his favorite Moroccan or Indonesian food, from his point of view, every dish has a distinctive flavor, a variety of spices used to produce different flavors and a variety of food to choose from. Just like food, Benabdellah who always looks cheerful can even be laughed when he is asked where is his favorite vacation spot in Indonesia, although he mentioned Lake Toba, Bali, Lombok, Yogyakarta, and Bandung and perhaps the next destination will be Garut in West Java. Similar to Indonesia, the majority of Moroccan people are 99% Muslim and with the motto of God, Country, and King, this God-blessed country upholds the royal institution which is currently ruled by King Mohammed VI Saadeddine Othmani. Morocco is also called as Al-Maghribi, which in Arabic means the place where the sun sets. There is naturally a reason why this country is called Al-Maghribi, especially it is called because of the beauty of the sunset, clearly visible from the beach tips located on the edge of the Mediterranean Sea. Rabat is the capital of Morocco and like the capitals in other countries, the rhythm of life is always interesting, especially due to the acculturation of culture in Morocco; Berber has a strong traditional side mixed with European culture. The capital city of Rabat is crowded with office buildings in beautiful Art Deco-style architecture, luxury hotels as a holiday stop, as well as fine dining restaurants and classy places to visit. Casablanca is the largest city fortified sitting next to the Atlantic Ocean. Casablanca is also a port and commercial city located in the western part of Morocco. The remains of French colonial legacy are evident and Casablanca is even called a city that has high artistic works of art, considering many of Art Deco’s charming heritages in the form of buildings that now have been turned into Art Galleries and Museums, and in addition to the beautiful beaches. Casablanca is decorated with charming Mauresque-style buildings that are a blend of Moorish and European Art Deco style. The Moors came from the middle-ages and lived in Al-Andalus (read: Spain), Morocco, and also Africa. The majestic Hassan Mosque is the most beautiful Icon of Casablanca, completed in 1933, with a 210-meter-high minaret over which a laser decoration is directed to the city of Mecca. The city with a population of 3.36 million people truly a pamper to the travelers who go there with many good things that deserve to be collected as a typical souvenir from the Berber land. Casablanca was originally founded by a Spanish merchant in 1575 at the site of a village called Anfa, which was the place the robbers came from the north coast of Morocco. The city that had been devastated by the earthquake in 1755 was rebuilt by Sultan Alawi and now Casablanca is like a beautiful woman who often polishes her face to look more beautiful and the city has grown to become the largest economic and industrial center in Morocco. Behind the city walls, there are brick houses that are settlers of French descent and the narrow streets become an impressive place to explore. Benabdellah who has given the general lecture at one of the campuses in Malang and Jakarta, told a lot about his beautiful country, which is also one of the fastest growing centers of Sufism, especially in Fez (Fes). Moroccan distance that seems far away in the African continent can certainly be ruled out if the Indonesian people, especially Muslims who want to see closer the authentic Islamic arts and culture that are usually visited in another country when finished performing Umrah, even though it is a relic of the Moroccan. The long history of the Moroccan Empire and the culture of the nation which is a mixture of Arabs and Berber, the inhabitants of Saharan Africa, as well as European influence, usher Moroccans to a world history recognized by the international community. The Moors ruled the Andalusia region of Spain, from the early eighth century to the end of the fifteenth century, it can be said that Spain was under the rule of the Moors for almost 800 years and left a World cultural Heritage, UNESCO, namely – Alhambra and Mezquita. The influence of Moorish culture reaches far beyond the city and state boundaries; Sevilla, Córdoba, Granada and Cádiz are well known throughout Europe and North Africa as the great learning centers, renowned for the high arts and charming architecture of the houses. The authenticity of the Moroccan face which also holds the height of the Moor Al-Andalus civilization in Spain will provide historical value to anyone who wants to know and see Morocco up close. The smiling diplomat said clearly to me during a special interview session that took place at his embassy in early January 2018, that there are many beautiful places in Morocco and will be a pity if not visited; such as seaside tours on the outskirts of Mediterranean, religious tours (Sufi tourism), mountain tourism, skiing, health tourism, culinary tours, desert tours, as well as golfing circuits. Fez is slightly different from Rabat and Casablanca, and Fez is the center of scientists, priests, and craftsmen. Fez is very confident with the history and culture of a city of over one million people. In Fez, there are still about 70,000 people who choose to live in the so-called Medina, which is filled with donkeys as found in the old towns of Central Asia. Fez is one of the religious tourism destinations and there are many Indonesian students studying in this marvelous city, as described by Benabdellah. The attractiveness of Fez is truly remarkable; long, colorful, unbroken walled alleys leading to a box shape with a beautiful fountain that greeted people’s noses with the aromatic marinated dishes coming from citizen’s homes, rooftops that seem to reach the sky, the craftsmen who never stop creating masterpieces and the open doors which always welcome the guests to admire the beauty of their creation. Fez, really an ideal place to fall in love and even Erwina Wigneswara Pidekso, chief of one of the largest Sharia Banks in Indonesia said she wanted to return to visit Morocco with a million of beauty. Benabdellah added that the relationship between Morocco and Indonesia is full of history and ambassador who loves jazz and Sufi music wants to deepen the bilateral relations between the two countries, not only in the field of economy or tourism but also in the arts and culture. In July 2017, renowned calligrapher Filali Baba, an artist Henna, and a silver handicraftsman came to Jakarta and demonstrated their skills and received rave reviews from the Indonesian people. The Embassy of the Kingdom of Morocco plans to hold other major events in the coming months, such as performing arts, music, and culinary. 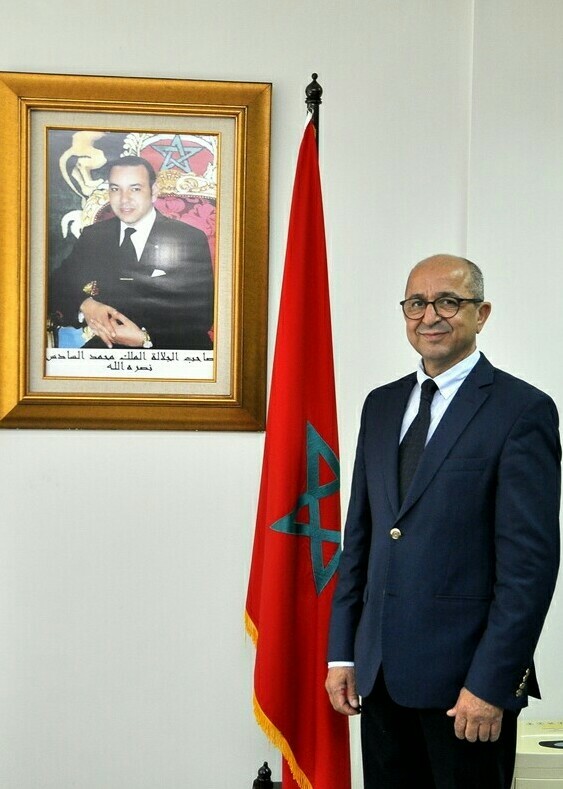 Benabdellah, who also graduated from Business Management from a renowned campus in France, indicated that Morocco wants to improve the field of exports and imports with Indonesia. Morocco still needs more imported Indonesian tea and coffee that have been exported to the world, even since centuries ago. As the world’s number one phosphate producer and exporter, Morocco is always ready to ship it to Indonesia which is looking to develop its agricultural productivity. Of course, there are many business sectors that can be developed together in the future. As a person who likes to travel to get to know other people up close; their life and their culture, the man who adores blue color told about the famous Argan’s oil. If the Indonesians want to look 15 years younger, then they must go immediately and find the original Argan oil in the corners of the city in Morocco and feel the greatness of the oil that is also used as food spice, especially by the Berber people. The oil contents of high y-tocopherol making Argan oil an alternative medicine for cancer patients. The Moroccan government will even increase Argan oil production from about 2,500 tons to 4,000 tons by 2020. The governments of both countries give each other eternal memories. If in the South Jakarta there is Casablanca road, then on the busy main road of Rabat city, there is Soekarno Street or Rue Soukarno, located just beside the large post office in Morocco and named in honor of the first President of the Republic of Indonesia who was meritorious while rallying the power of the third world countries in the 1955 Asian-African Conference in Bandung, West Java. Come to Morocco and be ready to fall in love with this fascinating country. *Nia S. Amira is an Indonesian author, journalist and linguist. She writes on culture, international affairs, multiculturalism and religious studies. Her articles have appeared in over thirty newspapers and digital media that are published in Europe, Asia, and the United States.